Recommended citation: Pezzilli R. Walled-Off Necrosis in Acute Pancreatitis: Clinical and Therapeutic Implications. OBM Hepatology and Gastroenterology 2019;3(2):11; doi:10.21926/obm.hg.1902017. The severe forms of acute pancreatitis may be characterized by the presence of walled-off necrosis (WON), previously called by other names: organized pancreatic necrosis, necroma, pancreatic sequestration, pseudocyst associated with necrosis and subacute pancreatic necrosis. It is defined as a mature, encapsulated collection of pancreatic and/or peripancreatic necrosis that has developed a well-defined inflammatory wall. WON usually occurs more than 4 weeks after the onset of necrotizing pancreatitis. However, it derives from the necrotic pancreatic parenchyma and/or necrotic peripancreatic tissues, and may be sterile or infected, single or multiple, and present at sites distant from the pancreas. In this paper, the current data regarding WON as to its definition, diagnosis and treatment will be narratively reviewed. Acute pancreatitis represents a challenging disease; it ranges from mild forms that are self-limiting to severe disease characterized by a number of local and/or systemic complications. In a prospective multicenter Italian study utilizing the original Atlanta clinical criteria for staging acute pancreatitis and released in 1992 , two categories of outcomes were identified: in 90% of the cases complete recovery characterized by clinical, laboratory and morphological resolution of the disease and 10% of the forms have morphological sequelae such as pseudocysts, fluid collections, fistulae. Overall mortality was 3.1%, and 19.2% of patients with severe acute pancreatitis died . In the majority of the cases enrolled (13 of 14 cases, 92.8%), the sequelae were mainly represented by pseudocysts requiring treatment during the follow-up in nine cases. Most importantly, a pseudocysto-jejunostomy was performed in six cases and percutaneous drainage was carried out in three cases. On average, treatment was carried out 13.7 ± 9.8 months after hospital discharge (range 1.8–29.7 months, median 14.7 months) . Seven out of eight pseudocysts were sequelae of necrotizing pancreatitis and, the presence of necrotic tissue was found in all of those patients who underwent interventional treatment (surgical or radiological) ; thus, these patients did not have true pseudocyst, and they were subsequently classified as having a new entity called walled-off necrosis (WON), previously called by other names: organized pancreatic necrosis , necroma , pancreatic sequestration , pseudocyst associated with necrosis  and subacute pancreatic necrosis . In this paper, the current data regarding WON as to its definition, diagnosis and treatment will be narratively reviewed. The introduction of the new pathological complication of acute pancreatitis, called WON, is defined as “a mature encapsulated collection of pancreatic and/or peripancreatic necrosis which has developed a well-defined inflammatory wall” and usually occurs >4 weeks after the onset of necrotizing pancreatitis . WON derives from a collection of necrosis of pancreatic parenchyma and/or peripancreatic tissues; it may be sterile or infected, single or multiple, and may be localized or distant from the pancreas (Figure 1). According to the revised Atlanta classification , many International and National guidelines such as the Italian consensus guidelines regarding severe acute pancreatitis, have added that when solid necrotic material is present within a largely fluid-filled cavity, the term pseudocyst should not be used and the term walled-off necrosis must be used . Thus, the development of a pseudocyst is a rare event after an acute episode of pancreatitis [11,12,13,14]. Figure 1 The content of the walled-off necrosis: fluid and necrotic tissue (courtesy of Prof. M. Mutignani, Ospedale Niguarda Ca' Granda, Milan, Italy). 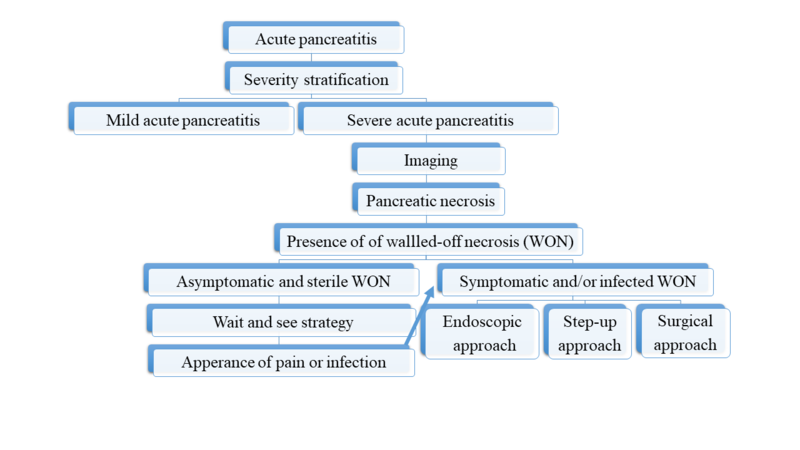 The interventional treatment of WON depends mainly on three clinical aspects and three questions need to be answered when approaching the treatment for this complication of acute pancreatitis: “Is the WON asymptomatic or symptomatic? Is the WON sterile or infected? Is the WON increasing rapidly in size?”. These three questions should be answered in order to explain the central role of clinical evaluation in these complicated patients. The reason why there is a persistence of pain in WON is not clear, and there are no studies regarding this aspect. 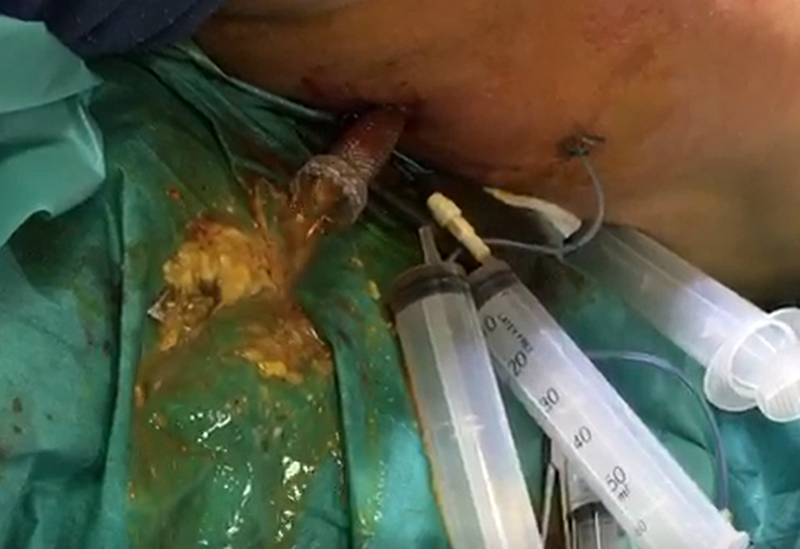 It is probable that the pain is strictly related to the pathological anatomy of this lesion; it is even more probable that a large encapsulated collection communicating with the main pancreatic duct is more prone to developing pain . Additional clinical studies should be designed to answer this question that cannot be considered only “mechanical”. WON can also obstruct the gastrointestinal tract, create one or more fistulas to adjacent anatomic strictures, and compress or erode into blood vessels or the bile duct . Finally, infection associated with WON represents another important clinical aspect. Retrospective studies have demonstrated that elderly age, severity of pancreatitis, and prior use of antibiotics are signs of infection . Fungal infections, such as Candida and bacterial infections (mainly Enterococcus spp. ), were organisms frequently isolated in WON . In pioneer studies, WON was identified according to contrast-enhanced computed tomography (CECT) criteria and, according to these criteria, WON was defined as heterogeneous content liquid and solid with varying degrees of loculations (sometime may appear homogeneous), and a well-defined wall which is completely encapsulated and is located within or outside the inflamed pancreas; finally, its maturation usually requires 4 weeks after the onset of acute necrotizing pancreatitis . Contrast-enhanced computed tomography may not easily differentiate solid from liquid content and, for this reason, pancreatic and peripancreatic necrosis may be misdiagnosed as pseudocyst (Figure 2, Panel A) . For this reason, MRI or endoscopic ultrasonography may be required for this differentiation (Figure 2, Panel B) . Demonstration of the pancreatic ductal communication is not necessary, although determination of such ductal communication is clinically important since it may affect management (Figure 3) . 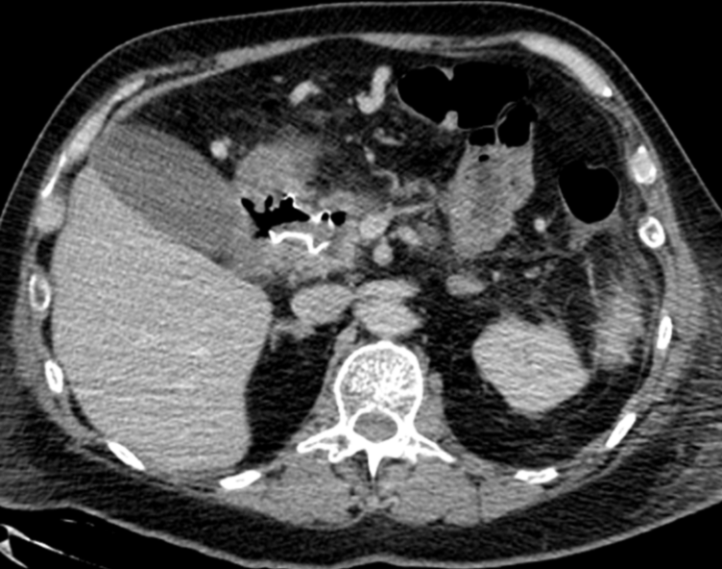 Even if CT is considered having the same diagnostic ability of MRI, it may have a limited role in differentiating the various types of peri- and intra-pancreatic collections, such as necrosis with pus, necrosis without pus and fluid collection without necrosis ; these imaging findings are better defined by MRI . Figure 2 Panel A. Contrast-enhanced computed tomography showing the presence of an intrapancreatic cyst containing homogeneous fluid. Panel B. Contrast-enhanced magnetic resonance of the same patient showing the same well-defined cyst containing fluid and necrotic tissue compatible with walled-off necrosis. 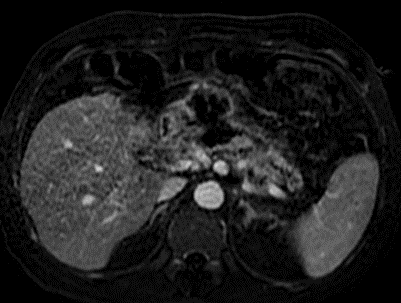 Figure 3 Contrast-enhanced magnetic resonance showing a disconnected main pancreatic duct in a patient with walled-off necrosis. There are several options for treating WON, i.e. medical, radiological, endoscopic and surgical options, taking into account that one third of patients may develop symptoms or complications (mainly infection)  and some of them may require interventional treatment. When the patient is afebrile and has no pain, the medical option based on a wait and see strategy may be a good option. It has been demonstrated that the majority of patients with asymptomatic WON has a benign clinical course, and usually the WON disappears during the following six months . In addition, it is possible that WON with an amount of fluid covering the necrotic tissue might have a greater tendency to regress , and the size of the WON is not a contraindication for this medical strategy (Figure 4a and 4b) . However, there are some questions mainly related to the follow-up of these patients. There are no data regarding the timing of the follow-up or the imaging technique utilized for the follow-up. Our policy is to initially carry out an MRI every three months for one year and then every six months. Of course, in the case of the appearance of pain or fever, our policy is to evaluate the WON with endoscopic ultrasonography and eventually treat the patient in line with the current data in the literature [18,20]. Figure 4 Change in the size of walled-off necrosis in a patient with acute necrotizing pancreatitis associated with hyperlipemia at the first observation (Panel A, year 2014), and after two years of a wait and see strategy (Panel B, year 2016). Percutaneous drainage, video-assisted retroperitoneal debridement (VARD), transmural endoscopic drainage and direct endoscopic necrosectomy, or a combination of these methods is considered as minimally invasive approaches. In a randomized study involving 88 patients with infected WON who underwent either an open surgical necrosectomy or a minimally invasive step-up approach utilizing percutaneous drainage or endoscopic transmural drainage, followed by VARD, the group having minimally invasive approach experienced a significant low rate of adverse events or death (40 vs. 69%) and fewer new onset of multiorgan failure (12 vs. 40%) . Most importantly, there was no difference in mortality (open group 16% vs. step-up 19%; however, the patients in the minimally invasive group had significantly lower rates of developing diabetes mellitus (16 vs. 38%) or requiring pancreatic exocrine replacement therapy (7 vs. 33%) as compared with the open surgery group . Subsequently, in a randomized study involving 22 patients with infected WON who underwent either a minimally invasive surgical procedure, constituting initial VARD therapy followed by open debridement, if necessary, or a direct endoscopic necrosectomy procedure, it was reported that the endoscopic necrosectomy group experienced significantly fewer adverse events or death (20 vs. 80%), fewer new onset of multiorgan failure (0 vs. 50%) and significantly lower rates of pancreatic fistulae (10 vs. 70% . In the era of endoscopic ultrasonography, it has been reported that in 98 patients with infected necrosis randomized to receive either an endoscopic step-up approach (endoscopic ultrasound-guided transmural drainage followed by direct endoscopic necrosectomy) or a surgical step-up approach (consisting of percutaneous drainage followed by VARD if necessary), the endoscopic step-up approach was not superior to the surgical step-up approach in terms of major adverse events, death, or new onset of multiorgan failure while the endoscopic step-up group experienced a significantly low incidence of pancreatic fistulae (5 vs. 32%) and had a significantly short length of hospital stay (53 days vs. 69 days) . In a retrospective analysis involving 133 patients who underwent endoscopic ultrasound-guided transmural drainage using either double pigtail plastic stents (Figure 5a) or lumen-apposing metal stents (Figure 5b), it was shown that patients who received lumen-apposing metal stents had significantly better outcomes as compared with double pigtail plastic stents in terms of number of endoscopic sessions (1.5 vs. 2.7), adverse events (5.6 vs. 36.1%), need for surgery (2.7 vs. 26.2%), length of hospital stay (4.1 days vs. 8 days) and overall clinical success (94 vs. 73.7% . Regarding the caliber of the stent utilized, it has been reported that a large-caliber fully covered metal stent (Figure 6) is significantly superior in terms of successful resolution of WON without the need for a direct endoscopic necrosectomy (60 vs. 30.8%) ; regarding metal or plastic stents, a systematic review showed that metal stents are superior in terms of overall WON resolution and fewer direct endoscopic necrosectomy sessions are necessary . It should be pointed out that, with the increased availability and use of metal stents in managing WON, it has been reported that when using these devices, there is a higher rate of bleeding as compared with double pigtail plastic stents [27,28]. A possible explanation is that the collapse of the necrotic cavity, the back wall of the cavity and interposed vessels may come into contact with the fixed lumen-apposing metal stents and result in a friction and erosion of these structures . The time for removing the stent is another crucial point in the treatment of WON. It has been reported that short-term (3.5 weeks) biflanged metal stent placement is an effective treatment for pancreatic WON. The majority of recurrences developed in patients with ductal disconnection do not require therapy; thus, additional pancreatic duct stents probably do not influence the recurrence rate . Figure 5 Treatment of walled-off necrosis with plastic stents: aspects at endoscopic ultrasonography (Panel A) and at radiology (Panel B). Figure 6 Treatment of walled-off necrosis with a metallic stent positioned using endoscopic ultrasonography. Most importantly, the duration of antibiotic treatment administered immediately before and then after endoscopic ultrasound drainage of the WON is still unclear. The American Society for Gastrointestinal Endoscopy guidelines for antibiotic prophylaxis for endoscopic procedures indicate that studies in which periprocedural antibiotics were administered, followed by a short course of postprocedural antibiotic therapy, resulted in minimal number of postprocedural infections . Sahar et al. retrospectively analyzed 61 patients treated for WON and found that a longer course of antibiotics (>5 days) seemed to have a similar outcome when compared with a shorter course (<5 days) in patients with WON. It is possible that a prolonged course of therapy may predispose to secondary infections, such as C. difficile colitis; however, a randomized controlled trial is needed to more precisely evaluate the role and duration of periprocedural antibiotics after drainage of sterile WON. Finally, after endoscopic drainage for WON, patients have a relatively preserved quality of life as assessed using the SF-36 questionnaire; as expected, patients who develop exocrine pancreatic insufficiency had a poorer quality of life as compared to healthy subjects  and this latter finding is in accord with a previous study involving patients having chronic pancreatitis associated with exocrine pancreatic insufficiency . A systematic review has recently been carried out to compare the safety of endoscopic drainage (ED) with minimally invasive surgical necrosectomy (MISN) for the management of WON  involving 641 patients (326 ED and 315 MISN). The rates of mortality for ED and MISN were 8.5% and 14.2%, respectively. In addition, no difference in mortality was seen in randomized controlled trials while ED showed an improved survival only in observational studies. The development of new major organ failure rates after interventions were 12% for ED and 54% for MISN. Regarding the rate of adverse events, there was no difference in the risk of bleeding between ED and MISN while ED had a significantly low rate of pancreatic fistula and low length of hospital stay as compared to MISN. In conclusion, ED should be preferred to MISN for management of WON because it is associated with low mortality, low incidence of major organ failure, low rate of adverse events, and low length of hospital stay as compared to MISN. According to the Italian guidelines regarding severe acute pancreatitis, if all non-surgical options fail, necrosectomy should ideally be delayed in order to obtain a well-marginated wall . In conclusion, WON is a relatively new entity of necrotizing pancreatitis and it is easily recognized using magnetic resonance imaging or endoscopic ultrasonography (Figure 7). Its treatment depends on symptoms and infection (Figure 7); in the case of complications, a minimally invasive approach, mainly endoscopic, is preferred. Figure 7 Algorithm for diagnosing and treating walled-off necrosis. Raffaele Pezzilli did all work. Hariri M, Slivka A, Carr-Locke DL, Banks PA. Pseudocyst drainage predisposes to infection when pancreatic necrosis is unrecognized. Am J Gastroenterol. 1994; 8: 1781-1784. Petrakis I, Vrachassotakis N, Kogerakis N, Koutsoumpas V, Chalkiadakis G. Subacute pancreatic necrosis. Panminerva Med. 2000; 42: 279-286. Bollen TL. Imaging of acute pancreatitis: Update of the revised Atlanta classification. Radiol Clin North Am. 2012; 50: 429–445. Kapoor K, Banks PA. Early prognostic evaluation of acute pancreatitis: An on-going challenge. JOP. 2013; 14: 10911. Hyun JJ, Sahar N, Singla A, Ross AS, Irani SS, Gan SI, et al. Outcomes of infected versus symptomatic sterile walled-off pancreatic necrosis treated with a minimally invasive therapy. Gut Liver. 2018 Dec 21. Bazerbachi F, Sawas T, Vargas EJ, Prokop LJ, Chari ST, Gleeson FC, et al. Metal stents versus plastic stents for the management of pancreatic walled-off necrosis: A systematic review and meta-analysis. Gastrointest Endosc. 2018; 87: 30.e15-42. e15.